"World Cup 98" redirects here. For the video game, see World Cup 98 (video game). "FIFA 98" redirects here. For the video game, see FIFA: Road to World Cup 98. "France 98" redirects here. For the charity association, see France 98 (charity association). "1998 World Cup" redirects here. For other uses, see 1998 World Cup (disambiguation). Qualification for the finals began in March 1996 and concluded in November 1997. For the first time in the competition, the group stage was expanded from 24 teams to 32, with eight groups of four. 64 matches were played in 10 stadiums in 10 host cities, with the opening match and final staged at the Stade de France, Saint-Denis. The tournament was won by host country France, who beat defending champions Brazil 3–0 in the final. France won their first title, becoming the seventh nation to win a World Cup, and the sixth (after Uruguay, Italy, England, West Germany and Argentina) to win the tournament on home soil. Croatia, Jamaica, Japan and South Africa made their first appearances in the finals. France was awarded the 1998 World Cup on 2 July 1992 by the executive committee of FIFA during a general meeting in Zürich, Switzerland. They defeated Morocco by 12 votes to 7. Switzerland withdrew, due to being unable to meet FIFA's requirements. This made France the third country to host two World Cups, after Mexico and Italy in 1986 and 1990 respectively. France previously hosted the third edition of the World Cup in 1938. England, who hosted the competition in 1966 and won it, were among the original applicants, but later withdrew their application in favour of an ultimately successful bid to host UEFA Euro 1996. On 4 June 2015, while co-operating with the FBI and the Swiss authorities, Chuck Blazer confirmed that he and other members of FIFA's executive committee were bribed during the 1998 and 2010 World Cups host selection process. Blazer stated that "we facilitated bribes in conjunction with the selection of the host nation for the 1998 World Cup". Since France won the selection process it was initially thought the bribery came from its bid committee. It eventually transpired that the bribe payment was from the failed Moroccan bid. The qualification draw for the 1998 World Cup finals took place in the Musée du Louvre, Paris on 12 December 1995. As tournament hosts, France was exempt from the draw as was defending champion Brazil. 174 teams from six confederations participated, 24 more than in the previous round. Fourteen countries qualified from the European zone (in addition to hosts France). Ten were determined after group play - nine group winners and the best second-placed team; the other eight group runners-up were drawn into pairs of four play-off matches with the winners qualifying for the finals as well. CONMEBOL (South America) and CAF (Africa) were each given five spots in the final tournament, while three spots were contested between 30 CONCACAF members in the North and Central America and the Caribbean zone. The winner of the Oceanian zone advanced to an intercontinental play-off against the runner-up of the Asian play-off, determined by the two best second placed teams. Four nations qualified for the first time: Croatia, Jamaica, Japan and South Africa. The last team to qualify was Iran by virtue of beating Australia in a two-legged tie on 29 November 1997. This was Team Melli's first appearance in the finals since 1978, the last time Tunisia also qualified for the tournament. Chile qualified for the first time since 1982, after serving a ban that saw them miss out on the two previous tournaments. Paraguay and Denmark returned for the first time since 1986. Austria, England, Scotland and Yugoslavia returned after missing out on the 1994 tournament, with the Balkan team now appearing under the name of FR Yugoslavia. Among the teams who failed to qualify were two-time winners Uruguay (for the second successive tournament); Sweden, who finished third in 1994; Russia (who failed to qualify for the first time since 1978 after losing to Italy in the play-off round); and the Republic of Ireland, who had qualified for the previous two tournaments. As of 2018, this is the most recent time Austria, Scotland, Norway, Bulgaria, Romania, and Jamaica have qualified for a FIFA World Cup finals, as well as the last time Portugal missed out. The highest ranked team not to qualify was Czech Republic (ranked 3rd), while the lowest ranked team that did qualify was Nigeria (ranked 74th). The following 32 teams, shown with final pre-tournament rankings, qualified for the final tournament. France's bid to host the World Cup centered on a national stadium with 80,000 seats and nine other stadiums located across the country. When the finals were originally awarded in July 1992, none of the regional club grounds were of a capacity meeting FIFA's requirements – namely being able to safely seat 40,000. The proposed national stadium, colloquially referred to as the 'Grand stade' met with controversy at every stage of planning; the stadium's location was determined by politics, finance and national symbolism. As Mayor of Paris, Jacques Chirac successfully negotiated a deal with Prime Minister Édouard Balladur to bring the Stade de France – as it was named now, to the commune of Saint-Denis just north of the capital city. Construction on the stadium started in December 1995 and was completed after 26 months of work in November 1997 at a cost of ₣2.67 billion. The choice of stadium locations was drafted from an original list of 14 cities. FIFA and CFO monitored the progress and quality of preparations, culminating in the former providing final checks of the grounds weeks before the tournament commenced. 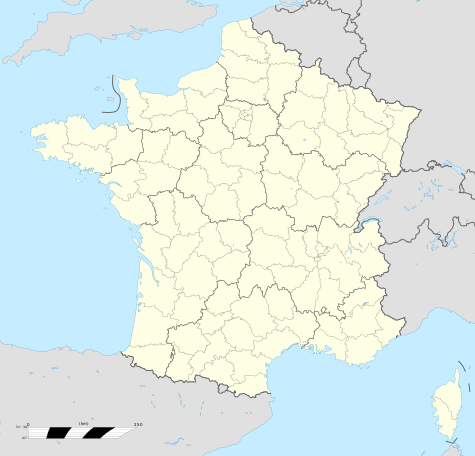 Montpellier was the surprise inclusion from the final list of cities because of its low urban hierarchy in comparison to Strasbourg, who boasted a better hierarchy and success from its local football team, having been taken over by a consortium. Montpellier however was considered ambitious by the selecting panel to host World Cup matches. The local city and regional authories in particular had invested heavily into football the previous two decades and were able to measure economic effects, in terms of jobs as early as in 1997. Some of the venues used for this tournament were also used for the previous World Cup in France in 1938. The Stade Vélodrome in Marseille, the Stade Municipal in Toulouse, the Gerland in Lyon, the Parc Lescure in Bordeaux and the Parc des Princes in Paris received the honour of hosting World Cup matches once again in 1998 as they had all done in 1938. 10 stadiums in total were used for the finals; in addition to nine matches being played at the Stade de France (the most used stadium in the tournament), a further six matches took place in Paris Saint-Germain's Parc des Princes, bringing Paris's total matches hosted to 15. France played four of their seven matches in the national stadium; they also played in the country's second and third largest cities, Marseille (hosting 7 total matches) and Lyon (hosting 6 total matches), as well as a Round of 16 knockout match in the northern city of Lens (also hosting 6 total matches). Nantes, Toulouse, Bordeaux, Montpellier and Saint-Etienne also hosted 6 matches in total; all of the stadiums used also hosted knockout round matches. This was the first World Cup where fourth officials used electronic boards, instead of cardboard. This was the first World Cup since the introduction of golden goals, banning of tackles from behind that endanger the safety of an opponent and allowance of three substitutions per game. 34 referees and 33 assistants officiated in the 1998 World Cup. As a result of the extension to 32 teams in the finals, there was an increase of 10 referees and 11 officials from the 1994 World Cup. As with the preceding tournament, each team's squad for the 1998 World Cup finals consisted of 22 players. Each participating national association had to confirm their final 22-player squad by 1 June 1998. Out of the 704 players participating in the 1998 World Cup, 447 were signed up with a European club; 90 in Asia, 67 in South America, 61 in Northern and Central America and 37 in Africa. 75 played their club football in England – five more than Italy and Spain. Barcelona of Spain was the club contributing to the most players in the tournament with 13 players on their side. The average age of all teams was 27 years, 8 months – five months older than the previous tournament. Samuel Eto'o of Cameroon was the youngest player selected in the competition at 17 years, 3 months, while the oldest was Jim Leighton of Scotland at 39 years, 11 months. Defending champions Brazil won Group A after only two matches as the nation achieved victories over Scotland (2–1) and Morocco (3–0). Heading into the third game, Brazil had nothing to play for but still started its regulars against Norway, who was looking to upset Brazil once again. Needing a victory, Norway overturned a 1–0 deficit with 12 minutes remaining to defeat Brazil 2–1, with Kjetil Rekdal scoring the winning penalty to send Norway into the knockout stage for the first time. Norway's victory denied Morocco a chance at the Round of 16, despite winning 3–0 against Scotland. It was only Morocco's second ever victory at a World Cup, having recorded its only previous win 12 years earlier on 11 June 1986. Scotland managed only one point, coming in a 1–1 draw against Norway, and failed to get out of the first round for an eighth time in the FIFA World Cup, a record that stands to this date. Italy and Chile progressed to the second round, while Austria failed to score any win for the first time since 1958 and Cameroon failed to get out of the group stage for the second time in a row. France, the host nation, swept Group C when the start of their path to their first FIFA World Cup trophy culminated with their 2–1 win over Denmark, who despite their loss, progressed to the second round. Nigeria and Paraguay advanced to the Round of 16 after a surprise elimination of top seed Spain, while Bulgaria failed to repeat their surprise performance from the previous tournament. The Netherlands and Mexico advanced with the same record (The Netherlands placed first on goal difference); Belgium and eventual 2002 FIFA World Cup co-hosts South Korea failed to advance. Germany and the Federal Republic of Yugoslavia advanced, each with 7 points (Germany took 1st through goal differential tiebreak). Iran and 1994 host United States failed to advance. Romania and England became Group G top finishers as Colombia and Tunisia were unable to reach the last 16, despite Colombia having one win. Argentina and World Cup debutants Croatia finished at the top of Group H while Jamaica (another debutant) and 2002 FIFA World Cup co-hosts Japan (another debutant) failed to advance. The knockout stage comprised the 16 teams that advanced from the group stage of the tournament. For each game in the knockout stage, any draw at 90 minutes was followed by 30 minutes of extra time; if scores were still level, there was a penalty shoot-out to determine who progressed to the next round. Golden goal comes into play if a team scores during extra time, thus becoming the winner which concludes the game. Croatia beat the Netherlands to earn third place in the competition. Davor Šuker scored the winner in the 35th minute to secure the golden boot. The final was held on 12 July 1998 at the Stade de France, Saint-Denis. France defeated holders Brazil 3–0, with two goals from Zinedine Zidane and a stoppage time strike from Emmanuel Petit. The win gave France their first World Cup title, becoming the sixth national team after Uruguay, Italy, England, West Germany and Argentina to win the tournament on their home soil. They also inflicted the second-heaviest World Cup defeat on Brazil, later to be topped by Brazil's 7–1 defeat by Germany in the semi-finals of the 2014 FIFA World Cup. The pre-match build up was dominated by the omission of Brazilian striker Ronaldo from the starting lineup only to be reinstated 45 minutes before kick-off. He managed to create the first open chance for Brazil in the 22nd minute, dribbling past defender Thuram before sending a cross out on the left side that goalkeeper Fabien Barthez struggled to hold onto. France however took the lead after Brazilian defender Roberto Carlos conceded a corner from which Zidane scored via a header. Three minutes before half-time, Zidane scored his second goal of the match, similarly another header from a corner. The tournament hosts went down to ten men in the 68th minute as Marcel Desailly was sent off for a second bookable offence. Brazil reacted to this by making an attacking substitution and although they applied pressure France sealed the win with a third goal: substitute Patrick Vieira set up his club teammate Petit in a counterattack to shoot low past goalkeeper Cláudio Taffarel. French president Jacques Chirac was in attendance to congratulate and commiserate the winners and runners-up respectively after the match. Several days after the victory, winning manager Aimé Jacquet announced his resignation from the French team with immediate effect. The All-star team is a squad consisting of the 16 most impressive players at the 1998 World Cup, as selected by FIFA's Technical Study Group. After the tournament, FIFA published a ranking of all teams that competed in the 1998 World Cup finals based on progress in the competition and overall results. The official mascot was Footix, a rooster first presented in May 1996. It was created by graphic designer Fabrice Pialot and selected from a shortlist of five mascots. Research carried out about the choice of having a cockerel as a mascot was greatly received: 91% associated it immediately with France, the traditional symbol of the nation. Footix, the name chosen by French television viewers, is a portmanteau of "football" and the ending "-ix" from the popular Astérix comic strip. The mascot's colours reflect those of the host nation's flag and home strip – blue for the jump suit, a red crest and with the words 'France 98' coloured in white. The official song of the 1998 FIFA World Cup was "The Cup of Life," aka "La Copa de la Vida" recorded by Ricky Martin. The match ball for the 1998 World Cup, manufactured by Adidas was named the Tricolore, meaning 'three-coloured' in French. It was the eighth World Cup match ball made for the tournament by the German company and was the first in the series to be multi-coloured. The tricolour flag and cockerel, traditional symbols of France were used as inspiration for the design. The sponsors of the 1998 FIFA World Cup are divided into two categories: FIFA World Cup Sponsors and France Supporters. Coca-Cola was one of the sponsors of FIFA World Cup 1998. The absence of Budweiser (which was one of the sponsors in the previous two World Cups) is notable due to the Evin law, which forbids alcohol-related sponsorship in France, including in sports events (and thus, being replaced by Casio). FIFA, through several companies, sold the broadcasting rights for the 1998 FIFA World Cup to many broadcasters. In the UK BBC and ITV had the broadcasting rights. The pictures and audio of the competition were supplied to the TV and radio channels by the company TVRS 98, the broadcaster of the tournament. The World Cup matches were broadcast in 200 countries. 818 photographers were credited for the tournament. In every match, a stand was reserved for the press. The number of places granted to them reached its maximum in the final, when 1,750 reporters and 110 TV commentators were present in the stand. The official video game, World Cup 98 was released by EA Sports on 13 March 1998 for Microsoft Windows, PlayStation, Nintendo 64 and the Game Boy. It was the first international football game developed by Electronic Arts since obtaining the rights from FIFA in 1997 and received mostly favourable reviews. Many other video games, including International Superstar Soccer 98, World League Soccer 98, Actua Soccer 2 and Neo Geo Cup '98: The Road to the Victory were released in the buildup to the 1998 World Cup and evidently were based on the tournament. FIFA: Road to World Cup 98, also by EA Sports focused on the qualification stage. Honorary FIFA President João Havelange praised France's hosting of the World Cup, describing the tournament as one that would "remain with me forever, as I am sure they will remain with everyone who witnessed this unforgettable competition". Lennart Johansson, the chairman of the organising committee for the World Cup and President of UEFA added that France provided "subject matter of a quality that made the world hold its breath". Cour des Comptes, the quasi-judicial body of the French government released its report on the organisation of the 1998 World Cup in 2000. ^ "France Gets 1998 World Cup". The New York Times. 3 July 1992. Retrieved 15 July 2012. ^ "France awarded 1998 World Cup". The Item. 2 July 1992. p. 3. Retrieved 15 July 2012. ^ "FIFA World Cup™ host announcement decision" (PDF). FIFA.com. Fédération Internationale de Football Association. Retrieved 15 July 2012. ^ "New Overtime Rule For 1998 World Cup". New York Times. Associated Press. 1 June 1995. Retrieved 27 January 2012. ^ Shaw, Phil (13 December 1995). "Italy and Poland bar England's road to France". The Independent. Retrieved 27 January 2012. ^ "Celebration and heartbreak". FIFA.com. Fédération Internationale de Football Association. 29 November 1997. Retrieved 27 January 2012. ^ "Soccer: Roundup – 1998 World Cup qualifying; Belgium earns berth and eliminates Ireland". New York Times. 15 November 1997. Retrieved 27 January 2012. ^ "FIFA/Coca Cola World Ranking (20 May 1998)". FIFA.com. Fédération Internationale de Football Association. 27 January 2012. ^ a b Dauncey & Hare, p. 98. ^ a b Dauncey & Hare, p. 99. ^ Dauncey & Hare, p. 107. ^ Dauncey & Hare, p. 101. ^ Dauncey & Hare, p. 104. ^ a b France 1998. Sport24, 5 May 2010 12:12. ^ "FIFA to crack down on tackle from behind". FIFA.com. 6 March 1998. Retrieved 12 July 2018. ^ Substitute the subs rule? By Mitch Phillips, 5 November 2007 Reuters Soccer Blog. ^ a b "Referees and assistants for France 98 chosen". FIFA.com. Fédération Internationale de Football Association. 2 February 1998. Retrieved 28 January 2012. ^ a b "Players Facts & Figures: Eto's the youngest, Leighton the oldest". FIFA.com. Fédération Internationale de Football Association. 8 June 1998. Retrieved 29 January 2012. ^ a b FIFA, p. 15. ^ "Her er de ti beste sportsøyeblikkene". Dagsavisen.no. Archived from the original on 12 September 2014. Retrieved 16 September 2014. ^ "Debutant takes third place with win over the Netherlands". CNNSI. Associated Press. 11 July 1998. Retrieved 28 January 2012. ^ Paul, Oberjuerge (12 July 1998). "France plays perfect host; hoists World Cup in Paris". Gannett News Service. Paris: SoccerTimes. Archived from the original on 28 November 2011. Retrieved 27 January 2012. ^ "World commentators decry Brazil, Ronaldo". CNNSI. Associated Press. 12 July 1998. Retrieved 27 January 2012. ^ "ZZ Top of the World". New Straits Times. 13 July 1998. Retrieved 19 June 2013. ^ "Zidane leads France to pinnacle of soccer glory". CNNSI. Associated Press. 12 July 1998. Retrieved 27 January 2012. ^ Barth, Elie (18 July 1998). "Il devrait succéder à Gérard Houllier comme directeur technique national". Le Monde (in French). Retrieved 27 January 2012. ^ "Jacquet steps down to move up". New Straits Times. 18 July 1998. Retrieved 27 January 2012. ^ "FIFA announces All-Star team". CNNSI. 10 July 1998. Archived from the original on 22 February 2014. ^ "All-time FIFA World Cup Ranking 1930–2010" (PDF). Fédération Internationale de Football Association. Retrieved 31 January 2013. ^ a b c Hand, David (1998). "Footix: the history behind a modern mascot" (PDF). Sage Publications. Archived from the original (PDF) on 12 November 2013. Retrieved 27 January 2012. ^ "Fabrice Pialot l'inventeur de la mascotte Footix". France 3 (in French). Institut National de l'Audiovisuel. 22 May 1996. Retrieved 27 January 2012. ^ "FIFA World Cup Official Songs 1990 – 2010". BeemBee.com. 10 June 2010. Archived from the original on 15 May 2013. Retrieved 29 May 2013. ^ Change to local timeChange to your time (14 June 2014). "Brazilian star Claudia Leitte to perform with Pitbull and Jennifer Lopez on the official song for the 2014 FIFA World Cup™". FIFA.com. Retrieved 26 June 2014. ^ "Fifa World Cup match balls through time". Telegraph.co.uk. 27 November 2009. Retrieved 29 January 2012. ^ a b "1998: adidas Tricolore". FIFA.com. Fédération Internationale de Football Association. 24 June 2006. Archived from the original on 5 July 2010. Retrieved 29 January 2012. ^ "2014 FIFA World Cup Brazil official partners". FIFA.com. Retrieved 29 December 2013. ^ "The Official FIFA World Cup™ Partners & Sponsors since 1982" (PDF). Resources.fifa.com. Retrieved 12 July 2018. ^ "2), Roberto BAGGIO/ITA vor dem Elfmeter zum 2:2". Gettyimages.nl. ^ a b c "3 n.E. HALBFINALE; Claudio Andre TAFFAREL/BRA haelt den...The Official FIFA World Cup™ Partners & Sponsors since 1982". Gettyimages.nl. ^ "2 , Frankie HEJDUK/USA, Mehdi MAHDAVIKIA/IRN erzielt hier das TOR zum..." Gettyimages.nl. ^ "Lens, 21.06.98, DEUTSCHLAND - JUGOSLAWIEN 2:2 , Freistoss von Sinisa..." Gettyimages.nl. ^ "1 , Jose SIERRA/CHI erzielt mit diesem Freistoss das TOR zum 1:0". Gettyimages.nl. ^ a b "Marseille, 23.06.98, BRASILIEN - NORWEGEN 1:2 , 1:0 TORJUBEL BEBETO,..." Gettyimages.nl. ^ "Marseille, 23.06.98, BRASILIEN - NORWEGEN 1:2 , 1:2 TOR JUBEL NOR -..." Gettyimages.nl. ^ "Paris; BRASILIEN - FRANKREICH FINALE; Zinedine ZIDANE/FRA erzielt das..." Gettyimages.nl. ^ "3 ; FRANKREICH FUSSBALLWELTMEISTER 1998; v.lks. : Frank LEBOEUF/FRA,..." Gettyimages.nl. ^ "26 June 1998 World Cup - Colombia v England, David Beckham scores..." Gettyimages.nl. ^ "Thomas Haessler of Germany takes a freekick during the FIFA World Cup..." Gettyimages.nl. ^ "Toulouse, 18.06.98, SUEDAFRIKA - DAENEMARK 1:1 , Schiedsrichter TORO..." Gettyimages.nl. ^ a b ",Lens, 21.06.98, Jens JEREMIES/GER nach dem 0:1". Gettyimages.nl. ^ "2 von Cuauhtemoc BLANCO". Gettyimages.nl. ^ "BRA spielt den Ball an Torwart Driss BENZEKRI/MOR vorbei". Gettyimages.nl. ^ "St.Etienne, 23.06.98, SCHOTTLAND - MAROKKO 0:3 , Abdeljilil HADDA/MOR..." Gettyimages.nl. ^ "Montpellier, 22.06.98, KOLUMBIEN - TUNESIEN 1:0 , JUBEL NACH DEM 1:0:..." Gettyimages.nl. ^ a b ",Lens, 21.06.98, GER JUBEL nach dem Treffer zum 2:2 durch Oliver..." Gettyimages.nl. ^ "5 n.E. ; Torwart Carlos ROA/ARG haelt den Elfmeter von Paul Ince/ENG". Gettyimages.nl. ^ "19 June 1998 FIFA World Cup, Nigeria v Bulgaria, Nigeria celebrate..." Gettyimages.nl. ^ "Davor Suker of Croatia and Lothar Matthaus of Germany stretch for the..." Gettyimages.nl. ^ "Football World Cup 1998, Brazil v Scotland, The Scotland defence leap..." Gettyimages.nl. ^ "- L'Express L'Expansion". LExpansion.com. ^ Dutheil, Guy (1998). Ministry of Foreign Affairs and International Development (France) (ed.). "France 98, vive le Football ! - Un véritable enjeu médiatique". Label France (31). Archived from the original on 18 February 2009. Retrieved 2 October 2009. ^ IGN Staff (15 July 1998). "World Cup 98". IGN. IGN Entertainment. Retrieved 15 July 2012. ^ Smith, Josh (5 June 1998). "World Cup 98 Review". GameSpot. Retrieved 15 July 2012. ^ James, Chris (July 1998). "Football's Coming Home". PC Guide. Future Publishing. 4 (4): 53–57. ^ Chemin, Michel (25 January 2001). "Cour des comptes: Coupe du monde". Libération (in French). Retrieved 29 January 2012. Dauncey, Hugh; Hare, Geoff (1999). France and the 1998 World Cup: the national impact of a world sporting event. London: Routledge. ISBN 0-7146-4887-6. "Rapport public annuel 2000 : l'organisation de la Coupe du monde de football 1998" (PDF). Cour des Comptes (in French). Archived from the original (PDF) on 4 December 2008. Retrieved 28 January 2012. "France 1998 Technical report (Part 1)" (PDF). Fédération Internationale de Football Association. Retrieved 28 January 2012. "France 1998 Technical report (Part 2)" (PDF). Fédération Internationale de Football Association. Retrieved 28 January 2012. Wikimedia Commons has media related to FIFA World Cup 1998. This page was last edited on 16 April 2019, at 15:30 (UTC).